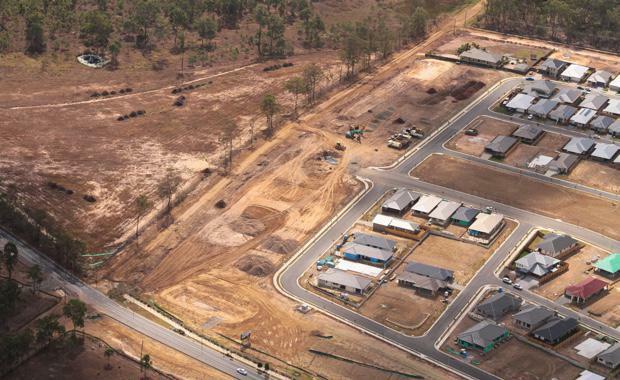 Developer Sekisui House has started work on the next phase of its $500 million masterplanned community Ecco Ripley in the Ripley Valley, near Ipswich, Queensland. The civil works on Stage 5 of the 4000-home development will involve the construction of 93 housing lots and a series of road upgrades around Ripley Road over the next five months. Sekisui House development manager Frank Galvin said the housing lots would include seven multi-unit parcels, in line with the company’s commitment to providing a variety of affordable and quality housing choices at Ecco Ripley. Mr Galvin said the road improvements would see the upgrade of Fischer and Nevis roads, the interim upgrade of the intersection of Ripley, Fischer and Wensley roads, and the connection of Parkview Parade to Fischer Rd. “The roads component of the Stage 5 works is going to improve connectivity, traffic flow and overall traffic conditions in the area,” he said. Mr Galvin said the $8.5 million in Stage 5 project work was being carried out with SEE Civil undertaking the civil works and was scheduled for completion by September. More than 130 residents now call Ecco Ripley home and dozens of homes are under construction in the community’s earlier stages. The developer recently has released 47 lots in Stage 4 ranging in size from 310sqm to 729sqm and priced from $153,000. House-and-land packages, including new duplexes are available from $318,900. Launched in 2013, Ecco Ripley continues to progress with construction underway on the $40 million first stage of the $1.5 billion Ripley Town Centre and also on the Ripley Road upgrade.